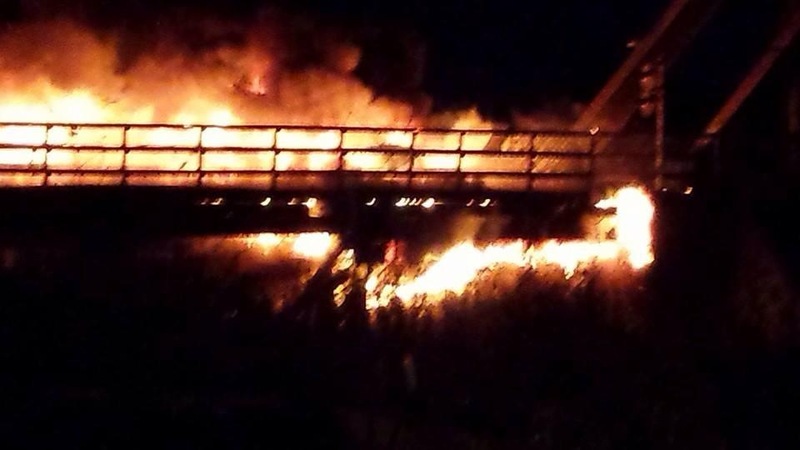 On October 29, 2013, the James Street bridge crossing the Kaministiquia River, which links Fort William First Nation with the city of Thunder Bay, caught fire. While the local media is tracking the criminal element of the fire, and while the politicians are promising to get to the bottom of what happened, there’s another story here that is going un-reported. As the bridge burned, social media lit up with white-settler racism directed at my reserve. It was a display of what most Canadians don’t like to admit, namely, that Canada is a racist place. Our communities – on both sides of the river – need to address the acts of hate speech posted online last night if we are to have a informed dialogue about what it means to live together in Anishinaabeg Aki, or Anishinaabeg territory. What is it about catastrophe that makes white people feel they can release racist attacks on Indigenous communities, in moments when they’re most weak nonetheless? The white settler consciousness is teeming with fear of Indigenous peoples to the point that its undercurrents spill out when communities like mine find themselves in an emergency. This fear is based in a deep seated recognition that, yes, white people have stolen the land and that, therefore, seeing Indigenous peoples reminds them – if only subconsciously – that their privilege in Anishinaabe Aki is built on (failed) attempts at historical cultural and physical genocide. This fear comes out as hatred: every single online news story about Indigenous peoples in this country is trailed by a scorched path of racist “free speech” vitriol. Canada has a racism epidemic, and it is easily traced in the comments section. While these tweeters are clearly young, they nonetheless are well versed in how to demonize Indigenous communities. Their comments beg the question: my community should be permanently closed off because, clearly, Indians are a threat to ‘civilized’ society. Such comments ghettoize Fort William First Nation; we should be locked up like animals and left to burn to death in our own cage. Interestingly, this reflects the government’s original philosophies behind Indian reservations altogether: fence Indians in and make it nearly impossible for them to leave. The kids learn to tow the line well. If white people can admit that racism in Canada exists, Anishinaabeg already know that its not going to disappear over night. There have been too many broken promises. As George Lipsitz has said about racism in the US context, those white people invested in their privilege are not going to give it up easily. As last night’s James Street bridge fire shows, the ‘possessive investment in whiteness’ in Canada is a burning bridge that insulates white privilege from facing the changes that are needed. What many people of Thunder Bay do not know is how cruel sparks of racism rising hurt Fort William First Nation peoples. It wasn’t long after the James Street swing bridge fire made it to the social media websites. So many comments stood out, but one that one that hurt the most was some guy saying he should block the other entrances to the reserve to save the city. This is beyond cruel – we’ve done nothing to provoke his threats. I find that the people of Thunder Bay always have something crude to say about Aboriginal people. While attending school I constantly have my ears open to the comments referring to Aboriginal peoples as “drunk, low life indians”. Why do you think that some of my people end up taking that road? What is easier – standing up to the racist comments or standing out of the way of them only to let it eat you from the inside out? We lose either way. My people are never going to find hope in the toxic [racist] environment we are forced to live in. The James Street swing bridge burning down not only showed a perfect example of the racism that has been going on for uncounted years, but also stirred up many emotions for the women in my community who feel unsafe in Thunder Bay. For many of us, the [James Street] bridge is the only way to get out of the city and back to a place where we feel a sense of safety, among our families on the reserve. To be ridiculed for losing that safety route only made me feel less safe [for the next time I’m in city]. Clearly, our youth know exactly whats going on. Unlike the authors of the racist tweets and Facebook posts, the young people of Fort William First Nation spoke from their heart about improving our relationship with settler society. While the peddlers of white settler racism are telling us that we deserve every bad thing that happens to us, and that we should just do ourselves a favour and die in a ball of flames to lessen settler fear and guilt, the youth from my community are calling on them to stop wielding their privilege at the expense of Indigenous peoples lives and safety. Thunder Bay exists on Anishinaabeg land, and we should not be made to feel unwelcome in our own territory. Most importantly, the youth from my community point to the fact that Anishinaabeg are not leaving any time soon, and so settlers better get used to it. That was very well said. I believe that a lot of racism showed immediately as I heard some of it myself. I also defended right away unlike some. I don’t believe it was started by anyone from the reserve as this is a large part of their economy as well as their way to school and shopping and everyday life. Why would you burn it? Common sense says nobody from the reserve would. But then again, common sense isn’t so common any more. I have native blood in my genes so I am not prejudice but I do get some of the rude remarks thrown my way as well. The natives were here first and as you said, Whites fear the unknown and attempt to change it to their way to block the fear. My parents are not racist and they taught us to be the same. My best friends growing up and still are close to my family are native. I’m in my own little bubble up here in Current River. I haven’t been on twitter in weeks an was totally ignorant to this recent public outburst of disgusting racism. Thanks for writing this. It’s not “nice” to read but the truth isn’t always comfortable. Hearing that certain people took it upon themselves to take this tragedy as an opportunity to make racist comments truly reminds us of the ignorance that exists in the world. But I can’t help but notice that anyone not of aboriginal descent in Thunder Bay are being referred to at “white settlers”. Being raised in Thunder Bay, I know myself there are many other ethnicities thriving in the city. There is a strong Italian, Finnish and Oriental (just to mention a few) presence in the city and I feel to group each of these cultures into the “white settler” stereotype is racist in itself. I am also highly offended that all the “white settlers” from Thunder Bay are being labeled as racist. A few individuals actions should not be a way for you to attack all of the residents of my hometown. Seems to me that this person is displaying the very actions they are condemning. I suggest you learn to lead by example instead of being a hypocrite. Its easy to take a few “bad apples” and form an opinion of the entire population of the city, but if we do the exact same thing, then we’re the racist ones?? Maybe you need to take a look in the mirror and realize its people like you that fuel the stereotypes you are so against. That’s how I see it. Hi Jamie – Others have raised similar issues. I’ll paste my response to them for you here. But in addition, please note that I’ve accounted for the fact that not all white people are racists; in my post, I write: “those white people invested in their privilege are not going to give it up easily.” If you’re not one of those people, you have nothing to fear. I agree that change lies beyond “strategic essentialism” (i.e. the binary between settler and Indigenous), but I also disagree with you in that I don’t think we can bring our discussions to the point of change without Canadians first becoming aware of their complicity in settler colonialism. Settler colonialism is real – it animated residential schools, it animated land thefts and broken treaty promises, and it continues to animate Canadian-Indigenous relations (e.g. the Indian Act). As such, there ARE “settlers.” The danger of not pointing this out is that deeper power dynamics which, lets face it, revolve around white supremacy in North America more broadly, remain undiscussed and therefore are allowed to continue on. But as a note about definitions: In my article I made reference to ‘white’ settlers; ‘white’ settlers are just one type among many. Indeed, settlerism is not strictly a race-based thing: rather, its more about mindset. Being a settler is a way of living that marginalizes and/or denigrates the Indigenous culture, laws, language and politics that exist in the land upon which one lives. (Anishinaabeg can be settlers too if they were to displace another peoples) To deny such a persona exists in Canadian society is to miss a necessary step in consciousness raising and, therefore, in decolonizing this space. I would also like to address your concern over TBay existing on Anishinaabeg land. You’ll note in my piece that I never said Canadians need to leave said land; sharing it is their right under the Robinson-Superior Treaty. However, no where in the Treaty does it state Anishinaabeg agree to be mistreated through racism while living in this territory; the spirit and intent of said Treaty was one of respect. And while it could be said my piece is disrespectful (and this is different than “reverse-racism,” which doesn’t exist in a society of structural racism. For example, see Leonardo and Porter’s article “Pedagogy of Fear.”), I again point towards the need for strategic essentialism. If people are living in Anishinaabeg lands in ways the undermine and/or attack Anishinaabeg, then they are doing so as settlers and need to be reminded of where they stand – literally, on Anishinaabeg lands which demand respect. I wrote the exact same thing on someones FB wall that posted this. The author clearly has a hate for white settlers. Which is evident by his racial profiling of anyone who isnt native. And i say this as a indian from Lake Helen Reserve. Speaking of racism, it’s “Asian” not “Oriental”…you’re not describing a vase, you’re describing a group of people. I agree and couldn’t have said it better myself!!! As some one not originally from Thunder Bay I agree that there is a big issue with racism. But not just on one side. Keeping in mind this is coming from some one fully entitled to status but who has never gotten it and probably would not be believed if I had it anyway. Even the term “white settler” is at it’s roots racist. Our families have been here 3, 4, 5, generations we know nothing of up rooting our selves and going across the ocean to live. All we know is being Canadian and life in this country. We are native to Canada even if our ancestors were not. As long as people keep putting labels such as Italian-Canadian, Finnish-Canadian or any of the other ones thrown around and used to divide us racism will exist. hi there – i agree with you to a point. but there is also a need for ‘strategic essentialism’ when no one believes racism exists. hence the point of my post. you may also be interested in my response to Jamie Taniwa, above. Unfortunately, I believe the word you should use instead of racism is “biases”, maybe “prejudice”, or something along those lines. People can hold biases or prejudices against white folks. The same is not true for racism, and this is a very important distinction. Racism is the structural and systemic disadvantage faced by groups racialized as non-white in Canadian society. Racism is embedded within the legislative systems and reinforce clear power dynamics that privilege white folk over people of colour. Racism cannot exist against the dominant group in a society because that key aspect of systemic discrimination simply cannot occur against the privileged (white in our case) population. So as you read, the term white settler is not racism, it denotes the historical roots of white immigrants who have arrived in this country over the last few centuries. Many themselves were perpetrators of colonial genocide and racism, but more recently, most are just complicit with maintaining the system of colonial/racist power dynamics in the country. It’s important to be an ally and expose/challenge these racist structures. Only then will people be allied rather than divided. Great explanation. Thanks for posting. Okay, so good point. Racism does exist in Canada and yes, it does exist in Thunder Bay. What I couldn’t get past was the fact that you and the commenters you provided kept saying “my people” “our people”.. by saying that, you are aiding in the division of people by the colour of their skin, are you not? Also.. out of respect to the people you interviewed, you left their names out, in order to protect them from the people they “walk the hallways with”, but you did not give the same courtesy to the people you referenced from twitter, you actually gave links to their accounts. I understand that you’re frustrated, but I could not take this blog seriously as there were too many contradictions. hey – actually, im not frustrated. i see this all the time. your comment about protecting the identity of the tweeters is moot when you consider that twitter is a public space. even if i didnt post their handles, their remarks are permanently etched into the internet. as for your points about maintaing racialized division, i think ive said enough, except to add that if you agree racism exist here, then why would you kill the messenger when he (i.e. me) points it out to you. your attempt to shut down my argument in such a way is a classic form of protecting privilege: it wreaks of protecting the status quo through silencing those who challenge it. I think it is wrong that someone would post such rasist things, however it is even worse that whoever posted this article did not blur out the names of the young adults that posted the comments. Not only will it put them in danger but at risk as well, shame on you for whoever wrote this article, everyone deserve privacy and safety. They threw their rights to privacy and safety out the window when they posted those comments on twitter. Their racist comments are already public, Damien here just used it as an example in his argument, and they can’t blame anyone but themselves. However, I’m sure nobody is going to spring into action to physically harm any of them to defend the Native people. Shame on you for defending racism. I am not defending there actions . I’m defending there privacy , I know some of these children very well and they are not bad kids . Fighting racism with racism only makes things worth. Not true at all , I do not think they realized how powerful there words were, I know the families and hate messages are already coming to them, you put a target on there heads just because they said some hurtful , racist comments… I should post all the racist posts I see on the “white settlers”. It’s a 2 way argument, both equally as racist . “you put a target on there heads just because they said some hurtful , racist comments…” I would like to draw your attention to how you downgrade their actions to little more than negligence. Now I can’t speak for everyone, but by doing so, it seems to me that you have just made these “hurtful, racist comments” a non-issue due to personal relations with said individuals. In addition, as everyone else has already mentioned, these young people have already gone to the public with their racial remarks. How can you even say that the hate mail that they are getting is directly a result of Damiens post? The more likely situation is that people are lashing out against their original posts. and just to clarify, I’m not saying you should abandon your friends and join the angry mob against them… but it was clearly a stupid idea on their part. Instead of trying to defend them. try to help them understand why it is that they are being “targeted”. You can be emotionally supportive without trying to justify their actions. no, i think its fine to repost someone’s racist tweet. people do it all the time on twitter. what makes my post different is that ive contextualized their tweets as expressions of structural racism. i get it – it makes people feel uncomfortable. youre right. i should have included marshall’s other misguided post about how the bridge fire was burning up “tax payer’s” money (another trope of canadian anti-indigenous racism). If you are posting on social media sites you are letting the public see your personal opinion, I am the same age as those teens and I don’t think it violated anyone’s privacy. I use social media sites knowing my opinions and photos and ect will be seen to the world, and to express such hurtful statements they should be exposed for that, and maybe perhaps they will take this as a learning experience. does the money for bridges not come from tax payers? I’d have to agree that that is a fact! and if you can try and argue that the money appears from somewhere else your completely clueless. all projects in canada are funded by by the government, and Canadian tax dollars. So ya that bridge burnt down cost alot of tax payers alot of money. So i find it weird you chose to leave out a factual tweet, and only mention his racist tweet. Would that be because you are scared that there is a double standard on racism? Actually, I left out the tweet re “tax payer’s money” in order to not take liberty with the author’s inaccurate statement. The James Street bridge is owned and maintained by CN Rail: http://www.chroniclejournal.com/content/news/local/2012/05/11/james-street-swing-bridge-safe-says-cn-rail. Therefore, while using it as an example of racism would have easily demonstrated another common trope in Canadian anti-Indigenous racism, it was simply incorrect. Twitter is a public forum… the posts are already public domain silly. They brought this attention on themselves. Nice try at passing the buck though. Agreed 100%! It’s a little too late. The buck stopped when the young adults hit enter! Are you kidding?? Damien It must be so difficult to get your story across when you have people like this. I don’t even know what to say. Frankly I think these kids should get more media exposure then they might realize how stupid they sound. I’m a white, middle class, born and raised in Thunder Bay, generally “normal” teenaged male, also known as the exact type of person you’d expect to hate Native people. Seeing that things like this need to be written upsets me. Generally, people know racism is wrong in this day and age, but in Thunder Bay they seem to think its okay as long as it’s just towards this one specific minority? I grew up surrounded by all the same stereotypes that are wrongfully attached to the Native people in this city, but I realized that it 1.) is morally disgusting and 2.) perpetuates the issue, and simply realized “Hey, this society is wrong, I can do the right thing and not be a racist ignorant idiot!” Yes Native people were here first, and yes Europeans invaded and stole this territory, but that shouldn’t even matter. People are people, and NOBODY should be discriminated against just because of where they came from, its as easy as that. I just wish everyone could be treated equally so that this city would be a place to be proud of. hi wilford. thanks for your words. i dont mean to be rude, though i do mean to challenge you: it DOES matter when someone takes everything from you and then tells you to get over it. saying it doesnt or shouldnt matter is a form of silencing. im not saying youre doing this intentionally. but it does matter. I guess I did write that a little obscurely let me clear it up… Of course it does matter, history is very important. I was more or less getting to the fact that people shouldn’t be discriminated against because of their ethnicity. Native people shouldn’t have to say “you took everything from us I want some respect” it should really be as simple as “I’m a person, respect me.” The history of Canada is important to everyone that lives here, and the atrocities that Aboriginals faced should definitely not be forgotten, however they shouldn’t be the reason that the Aboriginal people are treated equally, it should just happen because its the right thing. Sadly that is not the case here, as Native people need to constantly fight and make their case as to why they do deserve that respect on their own land. More or less I guess this is me just wishing that things weren’t the way that they are. People deserve respect no matter who they are. I hope this clears up the point I was trying to make. ah. i see what youre saying now. thanks for sharing your thoughts. Hi Damian, what does equality mean from a First Nations perspective? I look at the issues facing First Nations from a western perspective and, therefore, apply western reasoning to a solution. It seams to me that this, as much as racism (which obviously still is an issue), is the problem. Do you have any thoughts on this or suggestions for good balanced literature on this. I hear a lot about the problems (speaking generally), but would love to hear more about solutions. @ David: In part, the solution is to unpack how mainstream society defines “equality.” that definition, in summation, states that everyone is supposedly equal in how they’re treated. but the fact is everyone is not treated equally in Canada: Indigenous peoples live under the Indian Act; they’re still contending with the effects of residential schools, where generations of children were taken for the specific person of killing the Indian in the child; and there are 600+ missing, murdered and traded Indigenous women despite Indigenous peoples comprising roughly 4% of the Canadian population. Addressing this, a number of scholars have argued that race dialogue needs to be 1) unsafe for white people who otherwise subdue hard discussions about how they’re complicit in perpetuating white supremacy and colonialism, and 2) that race dialogue needs to account for how Indigenous peoples/people of colour are marginalized through systemic barriers. In other words, “equality” for Indigenous peoples/people of colour is only found in attempts to actually privilege their voices in discussions that affect them in ways white people are not affected. This is my exact same experience growing up in Winnipeg! I can’t believe how many otherwise decent people think it’s fine to totally degrade one entire race. And how many people assume I agree with them just because I’m white. I do not let them go on believing that assumption for very long. Similar to previous comments above. I truly understand the issues presented and I am a strong advocate of equality and fairness for aboriginal communities (and to all for that matter). However, (even after reading the authors replies) this post does nothing but alienate Canadians in the community discussed in to two. The First Nations people and those who aren’t. It creates a us vs them tone and clumps people unfairly. The problem that I see again and again with advocates for aboriginal rights is this mentality that all white Canadians dislike them and are racist and although this may be true of some individuals many like myself are not and have even worked in providing services to aboriginal communities in need. There needs to be open discussions about the issues going on and BOTH parties need to work to solve these issues. And it is okay to make people feel uncomfortable talking about these things because they are things that need to change. However, pointing the finger and labelling a group as the bad guys really takes things ten steps back. Seeing the situation from a birds eye view I can see why to this day there is so much problems between Aboriginals and non Aboriginal Canadians it has been a long relationship of mistrust, disrespect, pointing fingers and violence. Notice how I said relationship, because acts have gone both ways and I say this from a personal point of view (after being jumped and robbed at a reserve when closing the health clinic at the end of the day, and being name called and even spat on by members of the community) this however does not lead me to label all the members of this reserve by those actions I still respect them as individuals and know there are many good and respectable people who live there. hi i’m just a regular young adult that’s grew up in thunder bay for most of my life. i’m under 20, yes i’m still pretty much a kid still and i’m certainly not a genius. i have an opinion about all this though. growing up i really wasn’t aware of racism. I was friends with everyone. I never thought differently of someone just because of the colour that just how i am and how i will always be till i die. But recently as i got older i started to realize that there a lot of hatred and racism in Thunder Bay, that hatred stood out from all races not just white and aboriginals. I just couldn’t understand why people could be so hateful. its mind boggling. Reading this post i realized a few things. One being the kids that tweeted those comments clearly didn’t think about how powerful those word might be to other people. I mean kids make mistakes that’s apart of life, and i sure as heck have made a lot of mistakes as kid and i still do to this very day. I think that you posting there names might have opened there eyes but at the same time you put targets on them. I hear a lot about kids committing suicide because they were targeted in same way but because of bullying not racism. Its just when i see this i feel like that could happen and id like to not think that. Anyways i also realized that you yourself are a hypocrite. You fight against racism but yet your being racist to white people in calling them white settlers and that just doesn’t make sense to me at all. I feel like by the way you wrote this you have a lot of hatred towards white people. I dream of a racism free world, but that dream seem to be fading away because of people like you, the kids that tweeted those nasty things and the people that are commenting hateful things about this post. All i see is racism and it makes me sick to my stomach. You grew up and never heard of racism? What colour was the sky in your world. You never heard your dad at the dinner table call down natives. Were never out with your buddies and saw a native “bum” and joked about him. Never was in a store and saw how we are treated differently? Give me a break. I was driven down old mill road in Nipigon by two cops who were gonna lay a beating on me. I got free once out of the car and ran in the bush. The cops didn’t know I walked every piece of that land. So yeah there is a lot of hate. How do we now share what we gave up; what others have ruined; and what is not enough to go around? The next time you see a native, give him/her a nod; a smile; a handshake; a hug. Start with you. I would shake your hand. my dad wasn’t in my life when i was young… and when i talk about never hearing of racism it was in my elementary years when i was just a kid. I started to see it when I was going to High school. yes i won’t deny it,I’ve been racist with my friends whom are not white when i was younger. I had black and native friends. We did it to joke around because they were stupid stereotypes, we knew they weren’t true. They called me white cracker, or redneck E.C.T . But at the same time id just throw it back at them and we’d just joke around about it. nobody took it seriously because we were all very good friends. I do realize Racism is a very nasty thing. It’s something i hate very much when people try to in-force stereotypes because of a few bad apples. those people assume its true, and that’s something i can’t stand.When I hear people being racist about natives I hate it because my younger brothers are half native as well as some of my family and good friends. when they say there drunks and what not i’m like my family and friends are native and there not like that. I also hate hearing people stereotype white people saying there all racist. I’m white and I don’t fall into that stereotype. I give everyone a smile or nod. I won’t do it because there native. ill do it because there people just like me. You sound like a nice person. I appreciate the feedback very much. To be honest i didn’t expect anyone to reply to my comment. The, “drunk, low life Indians,” part really struck home with me. That’s really the only thing I heard people say about the native peoples up there when I attended Confederation for two years. Little did they know that back home in Simcoe County I was best friends with a girl who was part native. So I know first hand that natives are not low life. It made my blood boil hearing these bigots spew their uneducated slander. Obviously because it’s offensive and far from true, but for me especially because of the fact that they didn’t even think that maybe I was friends with natives and that it would upset me, hearing what they said about people I care about. I just can’t comprehend how some people can have so little empathy. This is disturbing and sad. However, it is very understandable that people from my community (the dominant colonial-settler population) end up becoming racist without even realizing it, and often being aware, which then results in these horrific acts. Our society is racist against indigenous peoples. We harbour apartheid policy in Canada. These acts need to be acknowledged and social media is a strong tool. I just hope that dialogue remains at the centre. It is hard for such a complex dynamic in a schismatic society to break down barriers and learn from one another. But it is possible. There are many examples that social transformation can occur. I have hope. I am pleased that this blog is informing people of what is happening. Good job. I hope the people engaging with acts of racism and violent attacks on land, people or anything representing the indigenous peoples of this land will learn that we need to abandon these archaic viewpoints and start acknowledging our role in an oppressive society. I’ve passed through Thunder Bay once and from my experience and first impression I will never return. We drove from the Winnipeg to Montreal and arrived in Thunder Bay one August evening. We had dinner then placed a call to a hotel for a room, they were happy to accommodate us saying there are rooms available. Once I, an aboriginal female, walked up to the hotel that said had rooms available, were turned away because the rooms available ten minutes before had suddenly become unavailable. No big deal there’s plenty of other hotels I thought, so I moved on to another hotel, but again called ahead if they had a room available they said yes. We drive another ten minutes to other hotel and I walked in saying I just called about a room only to be informed they just filled the vacant room. No sorry just no rooms. I repeat this one other time and the third time was no charm. It felt like we were in the twilight zone. Naively thinking this is got to be a joke. We return to the restaurant chain we were earlier to figure what we were going to do. One lovely waitress heard our delimma and called her friend at another hotel and got us a room. She was one of two people that were nice to us in Thunder Bay. It’s already late in the evening we sleep then get up early and made a fast exit from that town. I make sure to share my story to my many friends to avoid Thunder Bay. I agree with some of the other comments here. This constant reference to ‘white settlers’ is probably as racist and stereotypical as the original posters. Only in their case, they’re probably stupid teenagers looking for a few moments of infamy which they got. I’m guessing the author of this piece is not. And sorry to say you didn’t mean ALL of THEM is no different than someone complaining about drunk Indians on welfare then saying oh he/she doesn’t mean all of them. I have many, many non-aboriginal friends and I’m offended for them that you’d just lump them into a category because of their skin colour. Again you’re perpetuating the very racism you claim to be speaking out against. And I’m sorry too many aboriginal groups claim reserves are racist ideas then push to have MORE reserves established, especially urban ones. What message do you think that sends to the wider community? If you really want to confront racism then build bridges. We could start by dropping the ‘white settler’ language and reach out to the majority of citizens and show the minority of haters their views aren’t tolerated. I like your premise. Racism vs racism will never get us anywhere but muck deep in our own often skewed opinions. But my questions is,, why don’t the majority of citizens show the minority of haters that their views aren’t tolerated? Because in my opinion sadly, many citizens seem to be tolerating haters just fine. not only tolerating but defending. I think what I take away from this blog post is that this division is a reality. That racism is alive and well, on both sides. And for those who are reading this post. What are the conversations that you are having? Are you showing the minority that you are not willing to tolerate their hate? I hope that you are, because those are the conversations that will make a difference. Hmmmm…well what are they our ancestors? were they Black settlers? were they Asian settlers? were they Martians? ….no..they were WHITE settlers….ok..maybe we could say Caucasian settlers….Our ancestors are known as settlers as are their descendents…sorry you have an issue with that but it is reality…Now some could argue and say well they were Italian, Scottish, Irish, yadda yadda…but then most of you call them Indians and almost none of you say Ojibwe, Cree, Nez Perce to differentiate. So saying “white settlers” kind of puts things in perspective for me. As for MORE reserves? no…they just want the land back that they were supposed to get with their original land settlements. You know that was already given to them but they got weaseled out of? Why do we think stuff like this is not okay in someone else’s country but we think it’s okay here? We learn from our parents. These children learned how to make these comments from adults. They learned how to hate from them. They learned how to be narrow minded. Teach your children well. Amen! Too long have cowardly haters stood in the back and yelled. With the internet these who preach hurt towards natives can be tracked by their IP address; their social media site ;etc. back to where they live. Ever notice how most white people will only call down natives when they have numbers? I stood alone most of my life and I never backed down or let someone call me down. I am Derek Hardy of lake Nipigon. 41 yrs. I have been here and I will stand alone or with my kin against any force that seeks to extinguish my fire. Fooling over protecting the mistaken and misguided from their impractical and senseless comment/s they had made on the internet is an exhausting stride that ends up going nowhere after all said and done. Racism spurns real issues with a foggy lens. This learned behavior becomes the perfect wedge tool for the weak and blind who claim to be strong and see all. Ironic it is to have an actual burning bridge and virtual burning bridges. It is by far easy to be weak and cowardly to blurt out expletives in the way of a pejorative clause, whereas it takes strength and courage to truly consider your word wisely. This conversation needs a loud speaker of all the thoughtful minds to get up and speak out. It seems the author of this is no different than the racist people they talk about through out the entire letter. “White settler” over and over again. Shows their true feelings about white people. Isnt grouping a skin colour into a title like that, racism in itself? Regardless if they are hurt about what a some people tweeted. It does not represent the city as a whole. The only people that can speak for the city as a whole is city council. (which all should be replaced in my eyes) How ever the author is trying to make it seem that way. All that letter is, is someone venting and feeling threatened so they are trying to be as tactful as possible while being racist themselves. 2 wrongs dont make a right. To the author – i am a proud Native Canadian. I am from Lake Helen Reservation. I understand where you are coming from but to display these kids names and use them as a representation of our town is wrong. Everyone has an opinion, we are all entitled that. Do we all have to agree with whats posted on the internet? Obviously not. So in respects to your letter. I acknowledge your frustrations written out in your OPINION letter. Opinion being as it is your own view on the situation, and how you see this city. All this finger pointing is making me upset. I won’t even state what race I am, but that I find racism deeply concerning. Who really knows how the bridge caught fire. How do we even know this was a racist act? The situation has however brought about high suspicions of racism between Thunder Bay and it’s First Nations which is hard to ignore. Obviously there are many First Nation residence who feel that they have been wrongfully treated by Non-First Nations in the past. The suspicious accusations of racism tied to the bridge burning is a reflection of the mistrust and open wounds that the First Nations side carries. How awful! And to make matters worse there have been rude comments made by some Non First Nations concerning the bridge burning. I would like to say to the First Nations people that I feel for your loss of the bridge, and the impact it has on your community as well as your faith in some Non First Nations who were all too happy to make disgusting remarks concerning the situation. To the Non First Nations I know that it affected some of your lives as well, and it’s annoying. To everyone, I’m really glad that nobody was injured. I hope they can find out what really happened. I hope we can learn to treat each other with respect. Not too sure why my comment didn’t pass moderation. I didn’t use any offending language or attack anybody. Merely offered a “dont judge a book by it’s cover” comment. While many others are offering the exact same view (and more worded responses), mine was lost. I thought at least, I was having a legit conversation/opinion about this subject. Yet it’s just being censored. Let’s see if this one will be approved. I still think that while there ARE some good points in here, the constant labelling of “white settlers” adds to the racism vs racism issue in this very blog. Fighting racism with racism is bad, no matter the intention. Hello. This article raises an interesting point, however I wanted to leave some feedback, most of which has already been commented here. For some background information I’m 16, and grew up in PA attending Catholic schools, so perhaps my experiences are limited (I live a rather sheltered life otherwise, outside of the internet). Personally, I’ve only experienced racism around 5 times in total. When I talk to others about it, they claim to have experienced it almost daily. As myself, my ultimate goal is to obtain the most objective view on this, and rightly so; racism is a very serious issue and can hurt others. Racism is something that DEFINITELY happens but I feel that this article and the subjective experiences of others are most likely over exaggerated to an extent. To what extent? I’m not certain. Again, I have only experienced racism a very few times. Some comments have already said that leaving the names was “inappropriate” or a breach of privacy. I don’t think it is either of those, but rather unnecessary. Leaving the names attached to the comments is practically calling for a witch hunt. This is (most likely) one of the last thing you want to do when trying to argue a point like this. If anyone cared enough, one could easily use google to find out who these people are. My next point is the use of the word “white settlers” when referring to the (for lack of a better term) white people who live in Canada today. Not only is it lexically incorrect, but some might take offensive to it (whatever that means, some people just don’t like certain names), not to mention you’re (presumably) including foreign nationals who came here recently. The white people living here today DID NOT choose to “settle” here. They are here because their ancestors from hundreds of years decided to come here. Now, I don’t need a history lesson to understand what the REAL white settlers did. They took the land, sure. Committed genocide on our people, and made a holiday out of it? Yup. What happened then, does not make modern people liable for the actions of their ancestors many generations ago. That is analogous to blaming modern day white people in the U.S. for slavery. My final comment is that you seem to have taken a very passive-aggressive approach to this article. Your language register makes me think that you have some personal issues with White people. This seems much closer to a rant than an objective analysis; I suppose this sells better though. Best of luck to you. my friend. I hope you take these points into consideration. I agree with “Lex.” Well said. Thank you, and thank you for these links, especially the second one. I must admit though, I find reading such papers very exhausting and tedious, and frankly deadening. Either way thanks for the reply. I’m very proud to be from Thunder Bay/Kakabeka Falls, but i’m so ashamed of the racism. It actually makes me sick to my stomach when i think about it. Thunder Bay needs to change – and i’d be happy to help spread the word. To the one person who said that “modern” people are not liable for the actions of their ancestors… *DRUM ROLL* And that is how treaties are broken. I moved away from Thunder Bay 11 years ago – I am currently living in a largely FN community – and I am non-aboriginal. I’ve gotta say…glad I left! I worked at a bank and I could NOT handle the racism that took place there – decisions based on whether the person was FN or not. It sickened me. I know Tbay is very racist and though my family and I visit often, I doubt I could ever make it our home again. It’s beautiful on the outside – but the underlying hatred and racism is HORRIFIC. I actually had a dentist’s receptionist, without flinching, discuss “those people” and how she thought they lived – while FN people were sitting not 10 feet away waiting for their appointment. I was sure to correct her…perhaps too gently. I love the community I live in. I love my friends here – and the family we have come to adopt. I think it is ultimately sad that others can’t see that what they are doing – the hatred they carry – isn’t working for them or anyone…if they took a leap of faith and let themselves learn to be more open to others and their viewpoints – their lives we be enriched….in the same way I believe mine has! As for FW Reserve, I am sorry for your loss and I truly hope new construction begins very soon. Damien you have a way with words and I think it is awesome you replied to some of the comments here. I don’t understand why a lot of these comments are so upset about your use of ‘white settler’. I don’t think in any way you ever implied it meant all white people, or all non-native people. It is historically accurate and describes an oppressive way of thinking that is still very rampant today. Is this defensiveness? I am white and never thought it meant me, perhaps because I know I am better than that. And the people I surround myself with are as well. And if anyone thinks that just because I am white I will be complicit in their hateful words, they are mistaken. I can’t believe people would say that you are the one dividing the races, by saying things like ‘our people’. Whether or not you said that wouldn’t change the fact that there is racial division. It’s a big problem and we’re not going to change it by pretending it doesn’t exist. That only benefits, surprise surprise, white privilege! This is why I think this is defensiveness. It’s a failure to examine privilege. The people making these comments would rather live in their world where no one is actually judged based on race, and that would be awesome, but it’s not the real world. I just feel bad for future children that will go through all of this too at some point in time, of any ethnicity. I understand this is an editorial piece, when I first heard about this I was told it was an article published via tbnewswatch. I would be upset reading these comments as well, individuals posting publicly on the internet should not be upset these tweets were included in this article. I will say though these kids should not have had their names and faces posted along with the article, they should have been blurred out. Yes what these kids did say was wrong and I’m sure they regret it and in time will learn from this, but I’ve been told from someone close to one of the individuals that they has received Death Treats. Not saying what they said or did was in any way right. But received death threats crosses the line. The last tweet wasn’t even racial at all, it how it was interpreted in the context of the article. Everyone wants a new bridge there. “They” can be referring to “People of Thunder Bay” “the FWFW” or “The rail company that owns it” or all of the above. To have this individual outed publicly for racist remarks is a shame. I refuse to drive across is because I feel that it is unsafe and not maintained. At least now this will be an opportunity for upgrading that bridge and making it feel safe for all those travelling on it. I’d like to offer my support to Damien’s arguments. As you said above, as an indigenous person it is difficult to speak out against racism/colonialism since the risks are immeasurable. I’m not from TB, nor have I spent much time there. I’m from Sudbury, and was made to know about the virulent racism against indigenous peoples at a very young age. There’s no doubt that we white settlers continue to benefit from the marginalization, exclusion, and violence that indigenous peoples face on an every day basis. My ancestors arrived in the St-Lawrence Valley in the 1630s and 40s. My first direct descendant fought in a militia in the Québec City area against the Haudenausonee. All of these 3rd, 4th, and 5th generation white folks commenting about how the past is the past and how racism goes both ways are very good examples of current racist ideologies in “Canada”. It is plainly evident that my ancestors and I have benefited immensely from the genocidal acts used against indigenous peoples. Whether in the early contact period (which many of the commenters seem to focus on exclusively), in Indian Act legislation (e.g., banning cultural practices, banning fundraising for and hiring lawyers, empowering Indian agents to regulate indigenous mobility, throwing indigenous women out of communities, forcing communities to adopt Band governments, starving communities intentionally), or in today’s continued imposed poverty due to unequal funding to FN and horrific violence against indigenous women by settler communities (e.g., Pamela George, Helen Betty Osborne, Robert Pickton’s dozens of murders) that go ignored (I name only the ones that get attention, there are hundreds that get none and will get none). Calling white people like me a “settler” is a legitimate analytical decision. It questions our rights to continue to dispossess indigenous lands. Besides the transgressions that occurred in the early colonial period re: land theft, for about a century under the Indian Act it was illegal for “Indians” to hire a lawyer to challenge the continued land theft that occurred, on the part of individual settlers and on the part of different levels of government. How many people have noticed that almost all of the conflicts between indigenous peoples and governments are about access to land? Its simple, Canada has erected a set of laws that make it legal to take away lands that the government itself and indigenous peoples agreed would be for the use of indigenous peoples. We have made a situation where it is criminal to claim land that we once agreed was not ours. Just to ensure that these types of laws would hold steadfast, we literally stole indigenous children from their parents and their communities; the RCMP, often with a priest/pastor, would show up with the threat of force and often with the use of force to remove children against the will of community members. Some people commenting here have suggested that nobody alive today (no white settler that is) has any responsibility for the past. Are you kidding me? I’m 35 years old and my father lived next to an Anishnaabek community somewhere between Sudbury and Sault-Ste-Marie, in a settler community with one of the largest and most violent residential schools in the country. Even though he was French-Canadian and the Anglos controlled everything in town, there was no question that he’d ever have to attend that terrible place. Never once did his family live under the terror of one day losing their child, most often forever, to the settler government. The poverty his family faced, sometimes even the despair, paled in comparison to what his indigenous neighbours had to contend with every day. And somehow I’m supposed to believe that the opportunities I’ve been given, the life chances that I’ve enjoyed have nothing to do with the fact that I was spared the fate of almost all indigenous children, now adults, of my father’s age? How about we multiply that privilege by twelve or maybe fifteen generations? My people have tried to exterminate indigenous peoples through all kinds of means that continue into today. The opposite is simply not true, it never was and simply won’t be. I have encountered more indigenous people in my lifetime who are willing and enthusiastic to work with me in order to make a better life for everyone, than I have met white settlers who legitimately wish the same. There are some bad apples among indigenous peoples, and there are some among white people too, but this isn’t what Damien is talking about. So bringing up some bad treatment on behalf of indigenous peoples, like a few commenters have done, is irrelevant. We’re not talking about “good” people and “bad” people, “nice” people and “mean” people. This isn’t kindergarten class. Indigenous peoples have simply never engaged in genocidal acts (organized, systematic attempts to exterminate a population) against settlers. 90% of indigenous populations died before five generations of Europeans had arrived on these shores, and whatever you may think about how that occurred, for the most part my ancestors did not offer safe harbour to those remaining exiles, they exploited them and used violence against them at every turn. In other words, they benefitted from the destitution that indigenous peoples suffered, and in many ways, continue to suffer in my (our) name(s). The fact that indigenous children are funded on average 30% less than non-indigenous children is a current travesty. On-reserve funding has been capped at 2% increase since 1996, despite the fact that population growth has been nearly 7%. No other community in Canada has faced these drastic budget cuts. None. It has meant that schools, health care, housing, and all other forms of services, already substandard pre-1996, are radically unequal in indigenous communities. Are we to believe this is simply a coincidence, that’s it not a continuation of the policies that have impoverished and destroyed indigenous peoples and life ways? I’m going to listen and consider what Damien has to say, regardless of how uncomfortable it makes me as a white person. In fact, I’ll listen to it and want to know more, precisely because I sometimes feel uncomfortable. Otherwise, I’m just reiterating an unearned privilege that makes the behaviour of these young people completely permissible. Thank you Darryl & Damien – all this stuff needs to be said, and you are both so eloquent with your words. I’m really interested in starting up a serious “anti racism” campaign in Northern Ontario – and Darryl – i also live in Sudbury, but i’m from Thunder Bay. We should talk. I think that intollerance is always a bad thing. To judge any group as a whole based on a single characterestic, be it race, gender, age, religion or culture, is to dehumanize them. That will always be wrong, and it will always be the opposite of civilized. We should be using this tragedy as an opportunity to build bridges of compassion, communication and empathy, from both sides. I personally have read and admired many things written by individuals in the idle no more movement and I am thankful for the environmental work being done by some indigenous people. I hope for more and better opportunities to work together and to learn together, for the good of all. If the author of this article wants some white folks to say racism exists, then that’s fine. It absolutely does and it needs to stop. We need to stand up and say it is no longer acceptable, but that has to go for everyone. That means not judging all of us by the colour of our skin as well. Everything on this planet was once part of something else, somewhere else. We are all stardust in every molecule. There is more about us that is the same and amazing, than there is that is different and to hate. Thanks so much for your articulate arguments, for providing a space for discussion, and for providing links to other articles. The concept of “white settler society” seems to distress many people but it is extremely important to our understanding of the structures of Canadian society, (as well as other white settler societies, e.g. the U.S., Australia, New Zealand, South Africa). Yes, drawing attention to our membership in such a society does make many of us uncomfortable but we can can only move forward by recognizing how we got to where we are today. Most of us don’t want to be labeled as “racist”. We want to be seen as “good people” but this isn’t what identifying Canada as a white settler state is about. As uncomfortable as it makes us, our society has been built through the uses of racism. That’s how dispossession was, and continues to be, justified. Some of us gain a lot through this racism; others lose a lot. It doesn’t matter who we think you are: we are all stuck in this set of relations – some of us born with various forms of “settler” privilege and some of us born with the burden of centuries of government-supported oppression. We don’t get to choose the bodies or social locations into which we are born. We do however get to choose whether or not we recognize the conditions built into our society. We also get to choose to participate in making positive change. We can get side-tracked by blaming a few “bad apples” or by yelling out that it’s “not MY fault” or “THEY are racist too”. In the end though, if we want to help make our communities better places (and our country a place that can claim to embody any kind of justice) we need to get over ourselves and start doing the work to challenge daily acts of racism and the bigger, systemic forms of racial (gender and class) oppression that underpin social and economic relations in Canada. Like it or not, we live in what was consciously and strategically created as a white-dominant, settler society. This structure is held in place through laws, through bureaucratic structures and through our investments, as “mainstream” Canadians, in being seen as “innocent.” If we can let go of this need for an identity of innocence, perhaps we can get on with the job our addressing the systems, and attitudes, that justify the privileging of some at the expense of others. As I person of European Heritage I must acknowledge that there is abundant racist attitudes in Canada, Thunder Bay and other parts of Anishinaabeg Aski. Racism in not isolated to persons of European background, but as the dominant culture it is incumbent upon us to take the lead in addressing these issues. We should not ignore the log in our own eye, by commenting on the mote in our neighbour’s. We must recognize that there is Freedom of Speech and Freedom of Thought. We cannot police thought and speech. People have the right to believe what they will and unfortunately some people will continue to have racist beliefs. Kudos to Cheif Georjann Morriseau and Mayor Hobbs for their Diversity Thunder Bay initiative. It is a good start. Racist attitudes will fade as they are examined in the light of day, by discussion and understanding between all stake holders. As a nation, we must examine our relationships with the First Nations Peoples from the most basic levels. We need to question the effectiveness of the Reserve system and Treaty obligations that are the foundations of our relations. These relations were founded upon outdated paternalistic ideas and were more often dictated rather than negotiated amongst equals. The ultimate issues as to how resources get developed, who controls that development and importantly who benefits from those resources are central to any future and ongoing negotiations. Skeptics will likely point out that no matter who the decision makers are, and to whom the benefits flow, it will most likely be the same corporations who make the lion’s share of profit (they would argue they invest the lion’s share of capital). Most likely all communities would benefit from jobs, investment, and royalties. We are a wealthy nation and there should be ample wealth for all to share. The fact that we continue to constrain First Nations to defacto ghettos should be seen as a National shame. This is my opinion and others have the right to disagree. Fear of the unknown, lack of empathy, failure to remember our mutual history, apprehension over who benefits from resources, and general misunderstanding, all feed into the ongoing issues of Racism. While there have been Commissions relating to Truth and Reconcilliation, specifically in relation to Residential Schools, these are only scratching the surface. It seems to be a good model, based on the South African precedent, but we need more. While initiatives like Diversity Thunder Bay are important, we need much more. A National Commission with the ability to make recommendations, a la Thomas Berger, to set the agenda for a truly open national debate is required. Every moral code acknowledges that we are responsible for each other. We ought to be our brother’s keeper, and want everyone to succeed to their fullest potential. Just because it’s utopian does not mean we should not strive.